Happy Tuesday everyone! Going to try to make this a quick post today because I have the worst headache. Alaina + migraine = incoherent typing. So it's just better if I make the post short and sweet. I bet my head wouldn't have hurt so bad if I decided to maybe edit the photos a day earlier. Adding watermarks can be a pain! Anywho, today is Tuesday, which means it is time for another post with the lovely Twinsies! This week we are sharing teal manicures for to raise awareness for Ovarian Cancer. 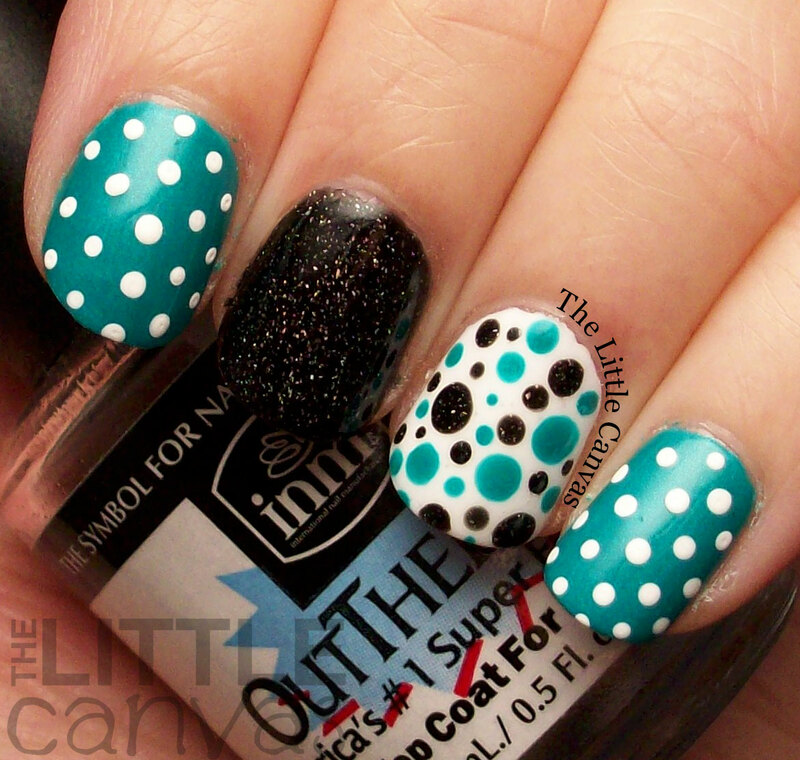 For my teal manicure, I really wasn't sure what to do, so I went with polka dots. You can never go wrong with dots. Let's take a look! How awful that I don't remember the name of the Salon Perfect white polish I received with my neon pop polishes earlier this summer. As you may remember, they were a prize from Sunday's Twitter #nailglossip conversation! Still in shock that I won them! Lately though I've been jumping around from whites that I cannot keep any of them straight, and typically I'm really good with knowing all the polish colors without looking. Headached Alaina is refusing to look up exactly what it is and instead will continue writing this rant about how she can't remember what the color's name is. I do remember the name of Gone Sailing though! Such a fun bright teal shade. I've always wanted a shade like this but couldn't track one down. It applies evenly in two coats, but I used three on my pointer nail because since it dries matte, it has a tendency to drag a bit. Nothing awful, but it just was more noticeable on my pointer so I threw on one more quick coat. I added a shiny top coat to even it all out. I then went through with my dotting tool and added all the different dots. 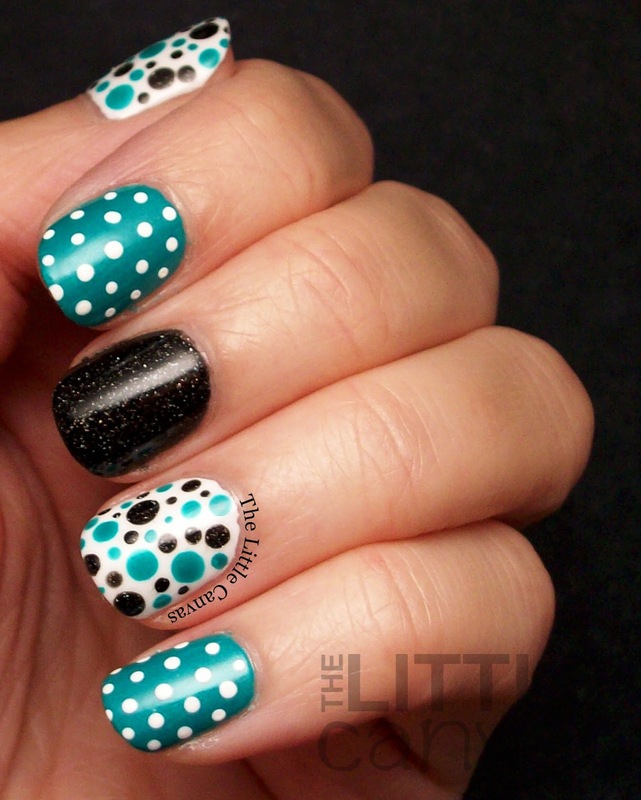 I remember when I started this blog, I was so afraid to do polka dot manicures. Now I feel like they are my go to design. I was looking back a week or so ago at my original dotticures and I've really come a long way! What do you think? Liking the teal? Liking the dots? Make sure to check out the other Twinsies!